Ayatollah Seyyed Ali Khamenei, Leader of the Islamic Revolution, warned against US threats to terminate the nuclear deal between Tehran and world powers, and stressed that if such a thing happens, Iran would not stay loyal to its commitments, either. Speaking in a meeting with the heads of the three branches of the Iranian government and the country’ senior officials in Tehran on Tuesday, June 14, the Leader pointed to the threats by some US presidential hopefuls to scrap last year’s nuclear agreement, known as the Joint Comprehensive Plan of Action (JCPOA), saying the Islamic Republic would respond strongly to such a move. “We will not violate the JCPOA, but if the opposite side violates it – as US presidential candidates are currently threatening to tear up the JCPOA – if they tear up the JCPOA, we will burn it,” the Leader stated, as reported by Press TV. Ayatollah Khamenei said the US has so far failed to fulfil a major part of its obligations under the JCPOA, while Iran has abided by its commitments, such as regarding its 20% uranium enrichment as well as constraints regarding the Fordow and Arak nuclear facilities. Ayatollah Khamenei said Washington’s issue with Iran is the very existence of the Islamic Republic, which cannot be negotiated. 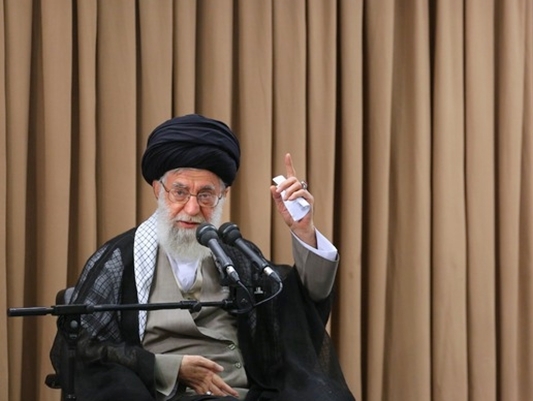 Elsewhere in his remarks, the Leader also warned of enemy plots to hinder Iran’s progress. “The agenda of the enemy today is to stop or eliminate the capabilities of the Islamic Republic, or at least to prevent their growth,” Ayatollah Khamenei emphasized. The Leader also stressed the importance of increasing the country’s capabilities. “I have often reiterated that the country must grow in power and that we must increase our potential,” Ayatollah Khamenei stated, adding that it is only then that Iranian officials can expect the nation to have peace of mind.